U.N. Secretary-General Kofi Annan: "A clear demonstration of the will of all the members of the Security Council to place the interest of the Iraqi people above all other considerations." The U.N. Security Council votes unanimously to adopt a U.S.-backed resolution on Iraq. CNN's Jane Arraf has a look at the significance of Iraq's new currency. CNN's Jane Arraf on a Shiite cleric who says he's forming an Islamic state in Iraq. (CNN) -- In a move the United States hailed as an important show of international unity, the U.N. Security Council on Thursday unanimously adopted the U.S.-backed resolution on Iraq. U.S. Secretary of State Colin Powell called the vote "a great achievement for the entire Security Council to come together again in this manner." "I'd like to thank those who co-sponsored along with us and all of those who over the last several days -- as we went through this, with misgivings and disagreements and debate -- realized at the end of the day ... we have come together to help the Iraqi people and put all of our disagreements of the past into the past," Powell told reporters. President Bush, giving a speech in California, also thanked the council for its vote. Russia, France and Germany, the main opponents to the war in Iraq, raised their hands for the resolution because, their representatives said, it is a good initial step. But representatives of those countries said more could have been done, pointing to the stated role of the United Nations and the transfer of responsibilities from the coalition to the Iraqis. Syria -- the lone Arab country on the Security Council -- voted for the initiative despite its bitter opposition to the war. Pakistan also backed the resolution but said it would not supply troops for Iraq. U.N. Secretary-General Kofi Annan said, "The process has been difficult, but the outcome is a clear demonstration of the will of all the members of the Security Council to place the interest of the Iraqi people above all other considerations." The Russian ambassador to the United Nations, Sergei Lavrov, said that the resolution clearly provides for eventual Iraqi sovereignty and that Russia is pleased with the efforts of other countries to achieve a consensus. "The result we achieved is a compromise that does not solve all the problems," but the pluses outweigh the minuses, Lavrov said. Jean-Marc de la Sabliere, French ambassador to the United Nations, said the resolution could have gone further. "It would have been desirable, in particular, for a clear-cut text to set timetables for transfer of responsibility and political transition," he said. Gunter Pleuger, Germany's U.N. ambassador, said, "Although we consider the resolution to be an important step in the right direction," it could have been a better resolution if amendments proposed by France, Russia and Germany were "fully integrated." "We missed a clear signal that transfer of sovereignty to Iraqis will be accelerated," Pleuger said. "The role of the United Nations, in particular of the secretary-general, could have been strengthened even more." The plan calls for the U.S.-appointed Iraqi Governing Council to set a timetable for drafting a constitution and holding elections by December 15. Powell said the resolution does not open the door for more countries to offer troops but it could help those nations that already were considering sending forces. A number of countries had said they would not send troops unless a resolution was passed. The United States also hoped to pass the resolution before next week's donors' conference in Spain to raise money for the Iraqi reconstruction effort. On Wednesday, Japan said that it would provide $1.5 billion in immediate aid, and Bush administration officials said Tokyo was working on a larger package of about $5 billion over several years. Linda Torres, center, wife of U.S. Army 2nd Lt. Richard Torres, watches as the flag that covered her husband's casket is folded in Clifton, New Jersey, on Tuesday. Torres was killed on duty in Iraq. On the political homefront, President Bush has been working to build congressional support for his $87 billion package for Iraq and Afghanistan ahead of a vote that could come this week. In meetings with GOP leaders, Bush forcefully opposed the idea of a loan. One senator, who asked not to be identified, said Bush told the group, "I'm not going to debate it," as senators started asking questions. Some Democrats, including presidential hopeful Rep. Richard Gephardt of Missouri, have said they would vote for the package. A leading critic of the Iraq war, Sen. Edward Kennedy, D-Massachusetts, is expected to announce Thursday he intends to vote against the president's $87 billion spending request. House Minority Leader Nancy Pelosi, D-California, said Wednesday she too would vote no, becoming the first member of the Democratic congressional leadership to go against the entire package. Senate Minority Leader Tom Daschle, D-South Dakota, has not said which way he will vote but has said he expects most Senate Democrats to back the bill. The vote is expected to take place Thursday or Friday. 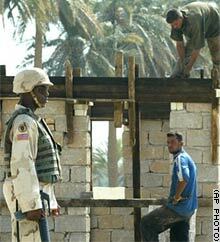 A U.S. soldier stands guard as two Iraqi contractors work on rebuilding a school at Jaafar al-Sakar, southwest of Baghdad. • U.S. troops came under fire Wednesday from a group of people the coalition said was trying to cross illegally into Iraq from Syria. The resulting gunbattle left several of the alleged infiltrators dead, coalition officials said. No U.S. soldiers were reported wounded, officials said, but a U.S. observation helicopter was forced down after small-arms fire hit it. CNN's John King, Mike Mount and Richard Roth contributed to this report.